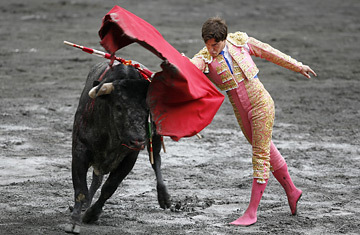 A matador in action in Bilbao, northern Spain. It's a crisp, fall Sunday afternoon. The weekend's chores are done and Monday morning is still hours away. You settle into the sofa, click the remote, and sit back to enjoy an NFL match on one of the major networks. But instead of three hours of gridiron bliss, you get a second-rate 1950s musical. While for American football fans this scenario is, these days, just a Heidi Bowl nightmare, for bullfighting aficionados across Spain it's suddenly a bad dream coming true. This summer, for the first time in its 51-year history, the state-run Spanish Television Corporation (TVE) has not broadcast a single corrida. At a time when the bloody ritual that was once Spain's "national fiesta" has come under increased scrutiny, it would be easy to read this absence as another sign that bullfighting is in trouble. In 2004, Barcelona declared itself "an anti-bullfighting city," and earlier this year an animal-protection law prohibiting new bullrings went into effect throughout the entire northeastern region of Catalonia. To prevent future generations from embracing the sport, the law also made bullfights R-rated: children under 14 can no longer attend the spectacles. But Andrés Moreno, a former matador who now raises bulls, is among those convinced that TVE's decision is just the latest unwarranted attack on this venerable national tradition. "TVE is television for all Spaniards," he argues. "It has a responsibility to show what Spaniards want. And the majority of us support bullfighting." But do they? Animal rights activists see TVE's decision as further evidence that the tide is turning in their favor  and the facts may back them up. A 2006 Gallup poll showed that 72 percent of Spaniards say they have "no interest" in bullfighting. Beyond the overt animal rights conflict, however, the situation may not be so simple. The latest round of controversy followed a story that El Mundo, a conservative daily lately devoted to accusing the Socialist government of undermining Spain's traditional values and identity, ran earlier this week. Yet TVE's decision is more than two years old and arguably has more to do with a 2004 code that prevents violence on public television during hours when children are likely to watch than with an anti-bullfighting agenda. The station also may be heeding simple economic realities. The cost of broadcasting rights has risen dramatically, and in recent years pay-cable powerhouse Digital Plus has monopolized high-profile fights like famed matador José Tomás' return to the ring in June after a five-year retirement. Regional stations have staked their claims as well, airing local fights most summer weekends. Money, then, rather than politics, seems the driving force behind TVE's shift. The Zapatero government has, in the past few years, loosened the state's grasp on the airwaves, establishing for the first time an independent committee to run the national station and opening the dial to new, private stations  forcing TVE to compete as never before. Bullfighting may still attract a sizeable audience share (El Mundo puts the average at 16%), but these days TVE is more likely to save its bidding power for universally popular offerings like soccer matches. TVE itself claims "there is no veto." So as aficionados cry foul and activists congratulate themselves, this summer's lack of bullfights on Channel 1 may indeed be little more than the market at work. Younger generations are certainly less attached to bullfighting than their elders, for whom matadors and bland movies were the primary entertainments. But Sunday afternoons have hardly been cleansed of blood and sand, and bullfighting's departure from public television may even be temporary: the government's proposed new media law would require networks and producers to include programming that "promotes national identity." The question now is just how bullish Spain's identity remains.